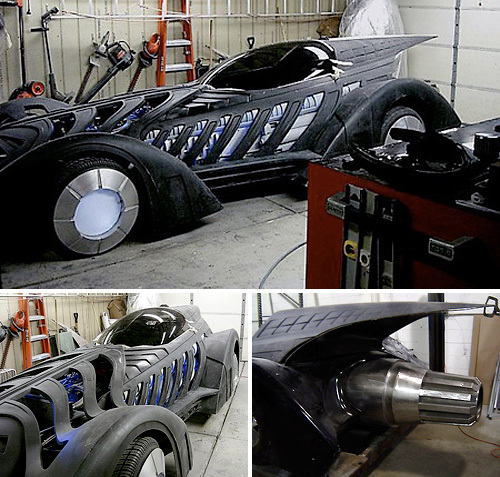 Guy Builds Batman Forever Batmobile Replica In His Garage – Doesn't Realize It Was One Of The Crappier Batman Movies | OhGizmo! Now that Christopher Nolan and Christian Bale have shown us how Batman movies are supposed to be, it’s hard to watch the previous 4 films without cringing. And that’s why I’m a bit confused as to why sculptor Bob Causey has put so much time and effort into creating a drivable replica of the Batmobile seen in Batman Forever, arguably where the original series of films first took a turn for the worse. Now I’m not knocking his craftsmanship or attention to detail, since this replica has a full working interior and a retractable hard top, but given the choice, I’d definitely go with the homebrew Tumbler instead. Dude, it's a pretty awesome car no matter what movie it's from. Maybe he'll build a series of them and have one from every movie. My last girlfriend had the same tattoo but without the “Attention” part. While the movie may have sucked, it doesn't really matter. The car looked cool, and this replica of the movie vehicle is absolutely amazing! That looks great!